Camille Mansouri is passionate about luxury hospitality and especially Le Crillon hotel, where she carried out her internship in 2012 and began her career as a commis. She went on to work in other luxury hotels before returning to Le Crillon when it reopened in May 2017. One day, she hopes to become the luxury hotel’s pastry chef. Why did you choose to study pastry? I chose the Pastry Diploma because it is my passion. I have always been fascinated by pastry! 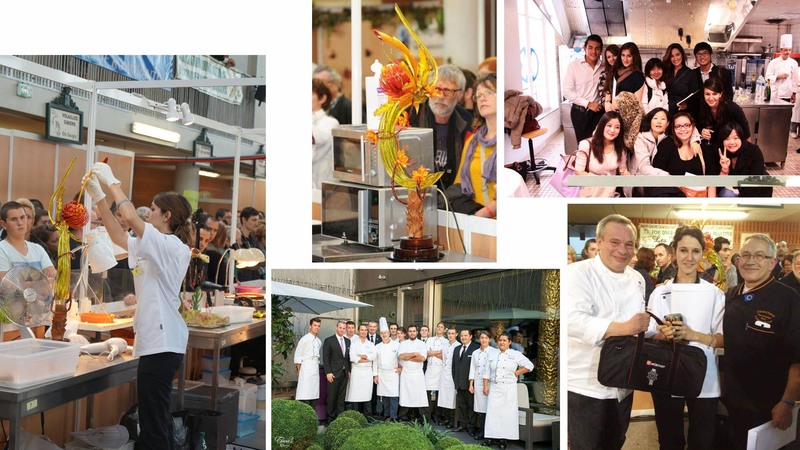 What is your favourite memory at Le Cordon Bleu Paris? There are so many! I loved studying at Le Cordon Bleu institute. I have fond memories of the demonstrations, but even more so of practical classes. I loved working in the school’s labs. Could you tell us more about your career path? After graduating with my diploma from Le Cordon Bleu institute, I carried out a two-month internship at Le Crillon hotel, after which I was taken on in my first role as commis. Le Crillon was due to close for refurbishment so I joined the kitchen brigade at Le Fouquet's hotel. I was rapidly promoted to the position of demi-chef de partie at Diane (Fouquet's gastronomic restaurant). I worked alongside Chef Gaetan Fiard (2014 World Champion Confectionery Arts), who introduced me to sugar art. In 2015, I came first (thanks in part to him) in the Trophée Gérard Barsé (a live competition lasting 8 ½ hours). In 2016, after 3 ½ years, we left Diane (Gaetan and myself) and began working at the Grand Hôtel de Saint-Jean Cap Ferra (Four Seasons). I worked as chef de partie. Upon my return to Paris in November, I immediately joined the kitchen brigade at the Peninsula hotel as chef de partie. I also filled in at the Westin Paris Vendôme hotel. Le Crillon hotel finally reopened in May 2017. It was a natural step for me both to return to the kitchen brigade and to once again work alongside pastry chef Jérôme Chaucesse. I fell in love with the hotel during my internship in 2012. If I could give one piece of advice to future students, it would be to have ambition, dreams and never lose sight of your goal! It is a tough profession but so very rewarding! I want to take part in (and win) several competitions in the future. One day I hope to be become pastry chef of an establishment such as Le Crillon. I aim to have a stellar career in the luxury hospitality sector. I am fascinated by the magic of Parisian luxury hotels.